July has been an outstanding month for stargazers, full of impressive views and cool planetary encounters. It all culminates on the night of Friday, July 27. The main attraction will be Mars in opposition. The Red Planet will be the brightest and largest it's been since 2003 when it was brighter than it had been in 60,000 years. If you're anywhere but North America, you'll catch the longest blood moon lunar eclipse of the century. And the cherry that tops it all off will be the peak of the Southern Delta Aquariid meteor shower. The shower occurs as the Earth crosses the orbital path of Comet 96P Machholz. Bill Cooke of NASA's meteoroid environment office tells Thrillist the Aquariids will "maybe" hit around 20 meteors per hour at its peak. That's less than the year's most active showers like the Perseids or Geminids, but the added celestial bonuses make it worth getting out. Unfortunately, EarthSky notes, the shower will coincide with a full moon. The moon's light can wash out some of the meteors. However, the Aquariids don't have a hard peak. "These meteors produce good rates for a week centered on the night of maximum," writes the American Meteor Society. The shower runs until August 23, but the most active period will run into early August. It will still be producing meteors when the peak of the Perseid meteor shower arrives on August 12. That storm is capable of producing more than 100 meteors per hour. Part of the reason for the low meteor rate with the Delta Aquariids is that they're best seen from the southern hemisphere. In the northern hemisphere, the radiant (where the meteors appear to originate from), is low in the southern sky. Because of that, you'll want to watch from somewhere with no obstructions along the southern horizon. If there are buildings, trees, or hills in the way, they could obscure meteors from sight. As with any meteor shower, you want to get out of the city and toward dark skies. The darker the sky, the better your view. National Parks and State Parks often provide an excellent place for viewing. The Delta Aquariid's radiant is in the southern sky, so it helps to look toward the constellation Aquarius, but not directly at it. The meteors will be moving away from Aquarius. You'll want to get out between midnight and dawn to see the most meteors. Cooke says the best time is likely to be around 2am local time. Again, the full moon, even though it's a micro-moon (the smallest and most distant of the year), will wash out some meteors. If you choose to wait until the arrival of the Perseids in about two weeks, we'll have a new moon, which will make for one of the best nights of the year to see meteors. Despite the conditions and the relatively slow rate of the Delta Aquariids, July 27 is an exciting night to be out stargazing. 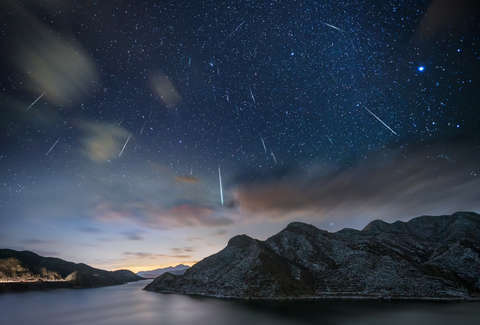 However, if the meteors are your main attraction, it may be worth waiting until the new moon on August 11 when you'll be able to catch the Perseids and the Delta Aquariids at the same time.